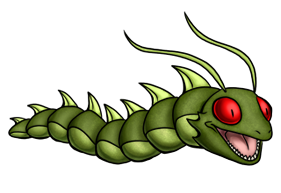 This Kreature has a ravenous appetite, using its long, sensitive antennae to seek out sustenance. It ambushes victims by launching sneak attacks from underground, and dismembers larger opponents by curling into a ball and spinning like a circular saw. A parasite in addition to a predator, it has been bred with a special fondness for Skullatrax eggs. It will locate the communal egg sac, burrow inside, and feast to it's heart's content until it is ready to metamorphose. The resulting Mantiserpent will then burst from the egg sac, devouring the queen and the rest of the colony. Updated comment: The Grubtile is another design where less is best. Its body has the segmented look and antennae of an insect, while everything else is reptilian. I also love the predator and prey relationship it has with Skullatrax.